Come on Amateur, we're all dying of suspense!!!!!!!!!!! Pleeeeeeeeeeeeeeeeease tell us, otherwise we'll have to send you the medical bills for stress, sleeplessness and loss of appetite due to suspense!!!!!!! Okay.... So I was partially right about Zoe Bernese Mountain Dog, Rottweiler?? Hank- Border Collie??? Pyrenean Shepherd??? actually Hank is indeed a little bit border. Well we have been dog people most of our lives and hubby is even a vet and we were WAAAAAAAAAAAAAAAAAY off with Hank - just goes to show you - most of us know squat ! 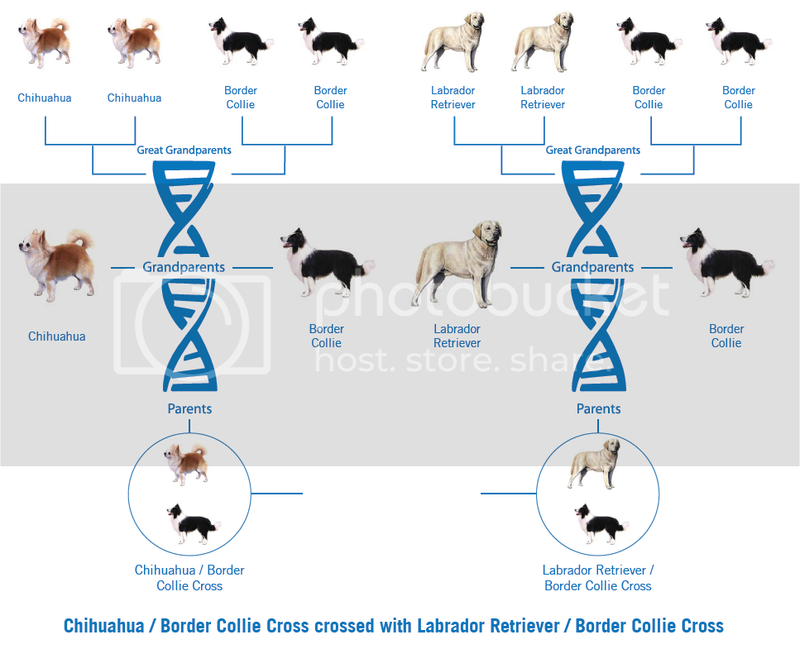 The thing is, depending on which DNA-testing company you used, you could get different results from different companies, depending on what breeds they have in their database. 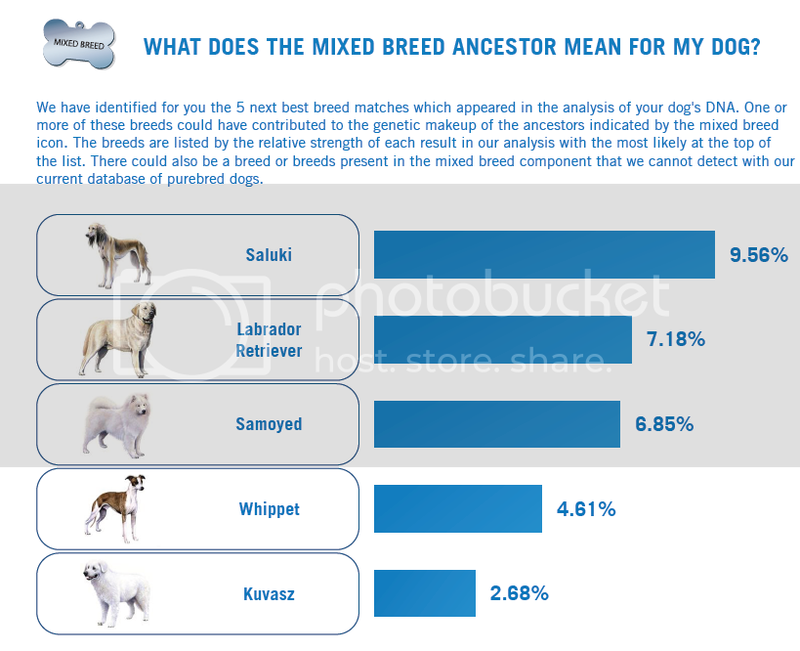 Results are coming back very mixed (and not completely accurate), even as experiments for pure-bred dogs, as when dogs are missing in the company's databases, or are back a generation or two, etc, etc, results are coming back skewed. Hopefully your results are (fairly) accurate - but if you had a pretty good idea (or guess) as to what your dogs were and now the results seem very different to you, you may be closer with your guess than their results, just sayin'. There's a video on Youtube of someone sending in a test on her purebred (with papers) Pittie (who came from a reputable breeder and I think was a show dog), and it came back as some kind of mixed-something or other, no Pit in it. Sooooo....... . Buyer beware. and we knew hank was a big ole mutt but with such a mix he is bound to look/behave and be something different to everyone. would love to try all the different companies but who has the money for that. LOL I'll send over one of my cats who's develop a "pee in the litter box problem"!!!!!!!!!!!! Phew!!!!!!!! Interesting mix, you never know what's in a Cross Bred dog!!!!!!!!!!! But the main thing is they're both GORGEOUS!!!!!!!!!!!!!!! 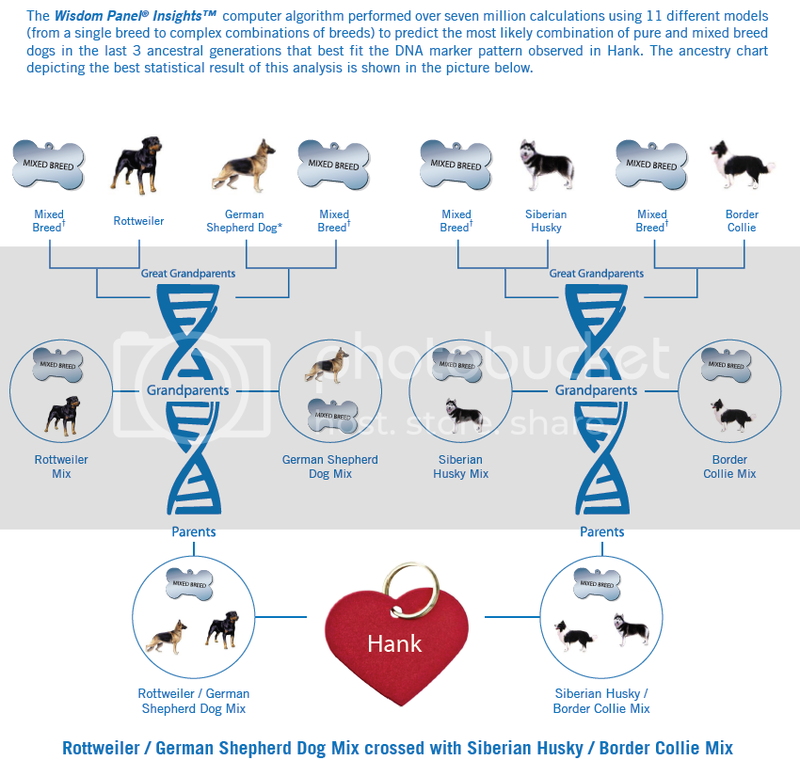 I would have never guessed rottweiler or husky in Hank. we thought she must be from real working class border with her behaviours - so I am thinking the surprise could be very well right. With Hank yes it was a surprise but those values could be still so low ( all we know is they are > 9.56 % ) so you wouldnt really see dominant characteristics. I am happy with the results ! And is was fun to guess!! !